Get your business name out there with custom, personalized business cards you’ll be proud to hand out. Want to save time and money? We can set you up with an account and all you'll have to do is log on and enter your business card information on either a pre-made or custom-made template. This way you won't have to wait for a proof! 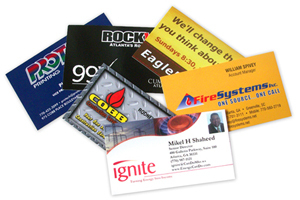 Your business cards will go right into production and into the hands of your customers in no time. Save on color business cards by using our Happy Hour Printing! If you need more than just a business card, we can create a corporate identity package complete with letterhead and envelopes.